Choose Your Colors- These stylish headphones come in a range of distinctive color options: rose pink, platinum gold, spearmint green and midnight black. Find a color that matches your preference and listen to your favorite music in style. Dual-Dynamic Driver- The coaxial and anti-tropic dual-dynamic driver design alleviates the build up of magnetic interference for high sensitivity. This ensures the consistency of the sound wave propagation from the different diaphragms so you can enjoy outstanding audio performance. Lightweight and Comfortable- Ergonomically designed earbuds with a 45° oblique angle and lightweight materials ensure a comfortable, secure fit during prolonged use. 3 additional sets of ear tips in various sizes ensure you get a proper seal in your ear for the full range of sound and noise isolation. Smart Remote Controls- Take calls, control music, and adjust volume all by the simple touch of a button. A superior integrated MEMS microphone ensures crystal clear communication as if you were talking face-to-face. Durable Cable- The silicon wrapped cable is soft, flexible and durable. You can put your stylish headphones into any bags or pockets without getting the wires stuck or tangled. 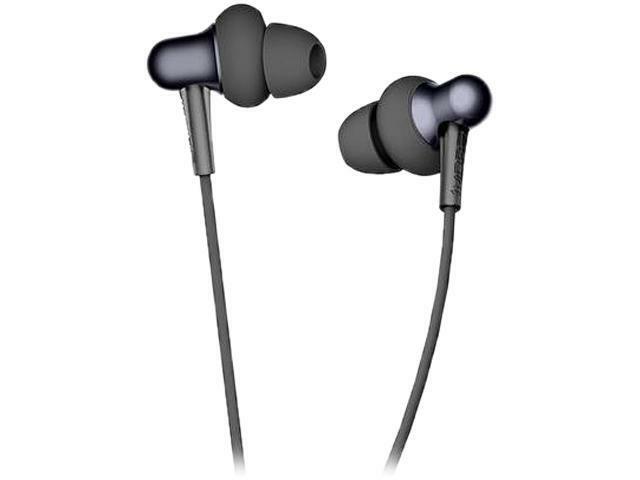 The suitable hardness of silicone makes the earphones withstand all types of weather conditions. Expert Craftsmanship- Developed with premium components, these stylish in-ear headphones feature NCVM surface processing, L-shaped 3.5 mm adapter, and durable in-line control buttons for added security when you are on the go.